Remember back in 2014, when the United States Department of Energy (DOE) set some regulations that banned the production of standard 60-Watt incandescent bulbs and T8 700 Series fluorescent tubes? You may not, since the change went pretty smoothly due to the number of alternatives that were already on the market at the time and that retailers could still sell remaining stock. Well, in an effort to make fluorescent lighting even more energy efficient, the guys down at the DOE have raised the efficiency bar again. This time the 800 Series T8 tubes are under review. The new rules strengthen energy standards by 1-4% for 4-foot linear T8s and 2-foot U-bend T8 lamps as well as raising the standards 7-10% for 4-foot T5 and T5HO lamps. By January 26, 2018, the majority of standard-wattage 800 Series T8 lamps and some reduced-wattage T8s will essentially be banned from being manufactured. About 20% of all lamps in commercial buildings and 44% in industrial buildings fall under the 800 Series T8 category. That’s over 500 million lamps. But since lighting is responsible for one third of the energy use in most commercial buildings the DOE estimates these new efficiency standards will save consumers between $2 and $5.5 billion over 30 years. That’s certainly worth the change. If you’re worried about these rules hindering the way you buy lights, don’t worry. Even with the ever rising energy efficiency standards, there are still options available. For the last few years, manufacturers have already been working on re-engineering their products. There are also exceptions to the new rules. Grow lights, colored bulbs, photography lamps, impact-resistant lamps, UV lamps, and bulbs designed for cold-temperature applications aren’t subject to the same energy efficiency standards as other light bulbs. Many reduced-wattage T8 tubes will be able to pass the new standards, however some products, mainly the 32-Watt T8 lamps, may end up discontinued. Luckily, customers will still be able to purchase the discontinued bulbs until stock is completely depleted. 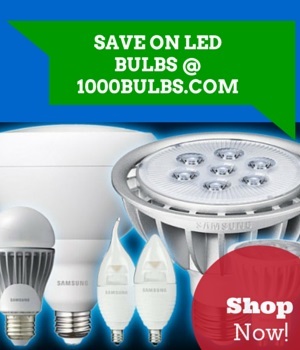 As efficiency standards continue to increase, more and more consumers are turning to LED technology. Switching to an LED tube can reduce the energy consumption in a fixture by up to 50%. Not to mention the up to 50,000-hour rated life of an LED T8 is much longer than their fluorescent counterparts. With those numbers, there’s little chance of falling to the DOE’s stricter regulations. What do you think of the DOE’s most recent efficiency regulations? Leave your thoughts and opinions in the comments section below and follow us on Facebook, Twitter, Google+, LinkedIn or Pinterest to stay informed on lighting industry news.